A selection of chair beds and leg lifters for disabled and elderly people who can't get upstairs or need help to lift their legs up onto the bed without the need for a carer. Chair beds have the versatility to provide all your sitting and bedtime needs and also give assistance rising to a standing position. Electrically powered they have easy to use hand controllers. 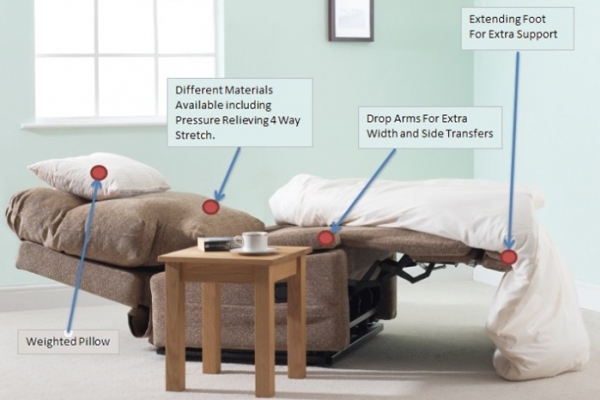 This chair bed is brand new to the market, and fills the gap for people needing help to lift their legs up onto the bed without the need for a carer. It can be a full size single bed (3ft with the arms down) down to a small single of 2ft 6. Can be used either upstairs or downstairs for people who can not get upstairs and has a standard weight capacity of 18 stone but can be upgraded to 25 or 35 stone. The electric powered leg lifter assists the user in getting their legs up onto the bed with the minimum of effort. This discreet, portable leg lifter is an inflatable device that provides essential assistance to lift and transfer the user's legs into bed independently. This webbing strap with stiffened stem enables the user to move a stiff or immobile leg, when using the bed, wheelchair, footstool etc.